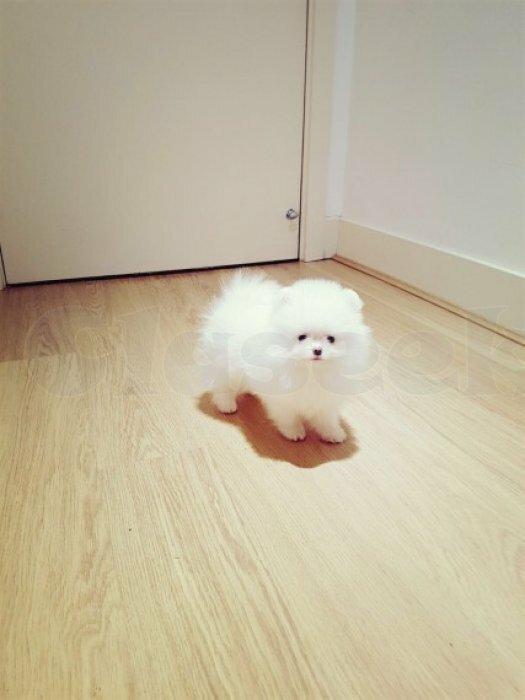 Amazing and very beautiful tiny miniature Pomeranian girl in pure snow white color. She is a beauty. She looks just like a fluffy little teddy bear. Very cute special pet. Premium quality deluxe teacup Pomeranian. She is purebred pedigree dog. Top quality. Very lovely and cuddly. Playful cheerful pup. She is going to grow only to around 3 pounds as fully grown adult. She is almost 4 month old now. Compacted small body. She can fit in your pocket or handbag. Absolutely amazing family pet. Chilled out and not yappy. Perfect for apartments. Perfect lap dog. Due to her tiny size I would like her to go to loving family as a pet not for breeding. She is very special and tiny. Absolutely gorgeous. The pictures are of the actual puppy. Please note that mini Poms always look bigger in pictures than in reality and there is always a "wow" effect when you view them live. So I highly recommend viewing her in person as She is even smaller and cuter than what I could present here in pictures. She is up to date with vaccines and worming. Micro chipped. available immediately. Please contact me for more pictures and information ([email protected]).